Rhonda Livingstone, ACECQA’s National Education Leader, speaks with Tina Thompson, Koori Preschool Assistant at Berrimba Child Care Centre in Echuca, Victoria about their bush kinder program. 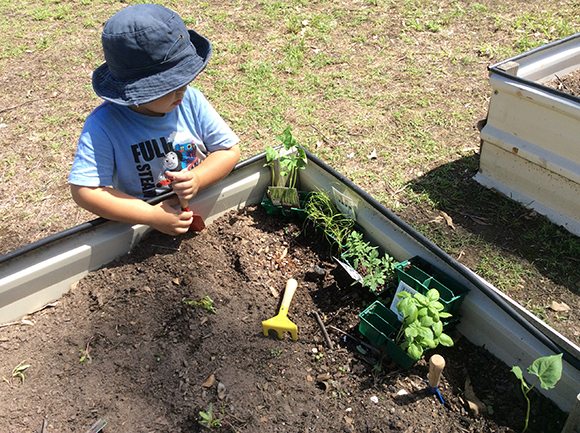 Every Monday at Berrimba Child Care Centre, children aged three and above are taken into the bush for a three hour program of exploring and activities. These visits provide opportunities for children to connect to the land, live their culture and explore nature, as well as scientific and maths concepts. Tina Thompson, Koori Preschool Assistant at the service, says the program fits well under the Belonging, Being and Becoming: The Early Years Learning Framework by linking with the five learning outcomes identified. 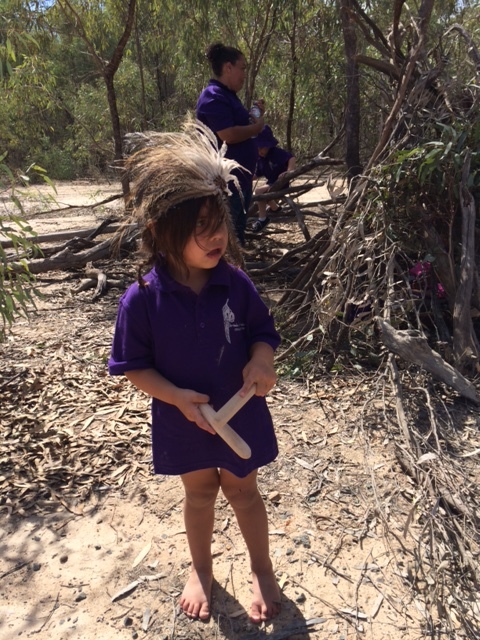 Tina spoke to me about the smoking and Welcome to Country (in language) ceremonies that educators and children collaboratively participate in to recognise the traditional owners and to cleanse their spirits. She talked about the valuable opportunities for children as they play and explore in the bush, giving time to leave behind any troubles they may be experiencing. Tina explained how “children need to know their culture, identity and be strong and proud, knowing and valuing their rich culture”. 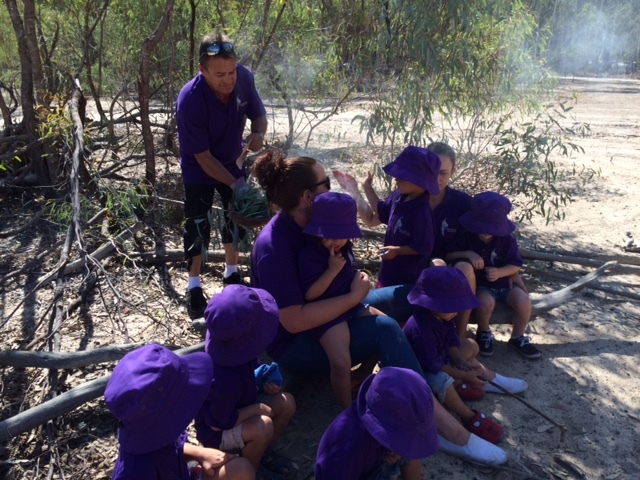 Science is a feature of these excursions into the bush with lots of discussion about the natural creations. For example, children were fascinated with the drying mud; Tina laughingly reported that children, at first, thought it was chocolate. The children talked and theorised about where the water goes. 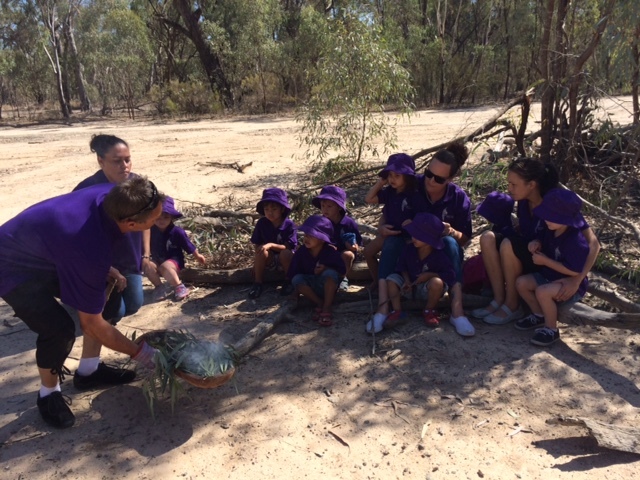 “It is really important to get our culture back and being out in bush kinder is a great way to connect with the ancestors and to thank Mother Nature for all the beauty around us,” said Tina. An example of an effective learning experience occurred when children at the service learned how to make a canoe under the guidance of Uncle Rick, an esteemed Aboriginal elder and strong male role model in the community. Educators take iPads to record the rich learnings, and share these with families and others in the community. “Children are learning about sustainability. Aboriginal people for generations have only taken what they needed; it is important for children to learn to respect and care for nature and follow in the footsteps of their ancestors,” she added. Last year, the children made a humpy (a shelter) in this beautiful natural environment. The educators were available to help and guide but the initiative, ideas and problem solving came from the children. “They are amazing,” Tina noted, explaining how they cooperatively gathered the sticks and worked out how to build it so it would stay up. During each visit, they would add to the structure, help each other, and play in and use it in a variety of ways, allowing each other space to explore, work and play. providing children with a connection while they are young, and the hope they will build a sense of belonging and respect for the country as they grow. Back at the service, educators can regularly be observed putting ochre (traditional Aboriginal body paint) on the young children and babies, and singing songs in language and dancing along. Tina pays respect to her colleagues Leona Cooper (jokingly called Boss Lady) and Joyce Ward, two women strong in their culture and relentless advocates for their families and community. These women work long and hard to ensure no child falls through the cracks and to advocate for these opportunities to continue to enrich the lives of children in the Echuca community. How can we give children more opportunities to contribute meaningfully? To their services? To their community? To their cities and world? 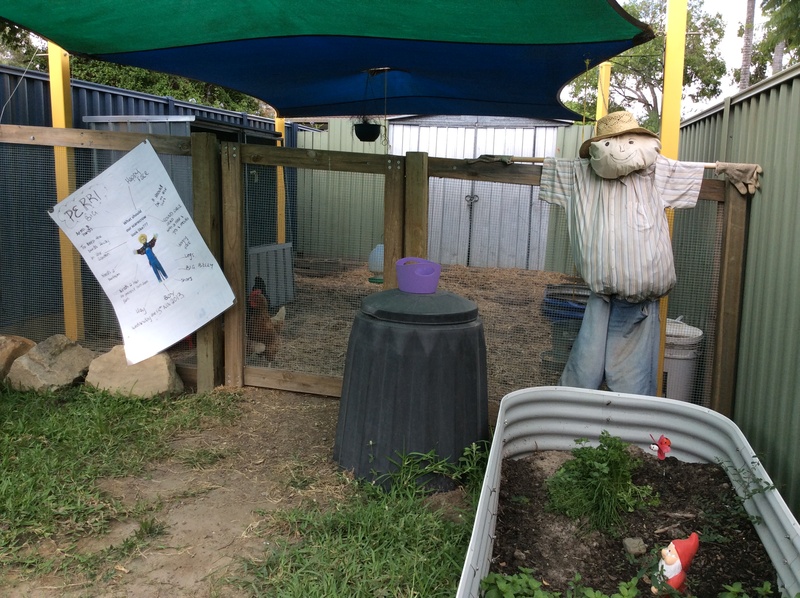 Bridget Isichei, an early childhood educator and former director of UnitingCare Jack and Jill Preschool Grafton and area manager for Goodstart Early Learning, writes this month about the journey of children’s participation in an exciting council playground project. The United Nations Convention on the Rights of the Child tells us that children have the right to have their voices heard and their opinions considered. For most of my own career, enacting this meant asking children to contribute to the design of their play-space or encouraging them to develop their own behaviour guidelines (in line with National Quality Standard Element 1.1.6). More recently, I have been engaged in a project that has changed my thinking about this. I now realise we can do more and dream of a world where children are given the opportunity to contribute meaningfully to community discussion, and mould the cities and towns that they live in from the day they are born. The project started during my time as the Director of UnitingCare Jack and Jill, when a group of preschool children wrote to the Clarence Valley Council to express their opinion that their town had insufficient playgrounds, and asking if they could design a better one. To our delight, the council agreed at the perfect time since they had budgeted for a new playground the following year. Within just a few months the council saw the value of consulting young children and invited three other early education and care services to become involved. As the director of the preschool that originally approached the council, I was given a place on their committee. We reflected and decided that although children have the right to participate, they don’t have to. We set up a learning space in each service where children could visit and record ideas if they were interested in the project. We spent time explaining the benefits of children’s participation and voice to all stakeholders. Educators decided to hold small group times for interested children to increase their knowledge about playground design, recycling and inclusion. The designated learning area was set up with books and information about the project so the children could revisit the area and build skills over time. Continuous learning, high expectations and intentional teaching were therefore critical elements in making the project successful. 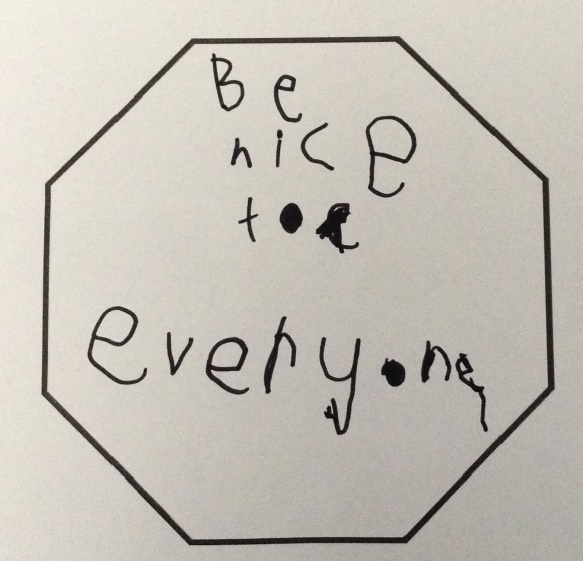 Children were encouraged to reflect on and refine their ideas. Children were given the opportunity to consult with each other and park design professionals to find out if their ideas were practical. By revisiting these ideas regularly, children were able to develop their thinking. The design for the new park now includes signs written by the children, has equipment that is inclusive of all children, recycling bins, a very tall tower, sand and water play and children’s art. The park will have a special seat that ‘you can sit on if you have no friends and someone will come to play with you’. 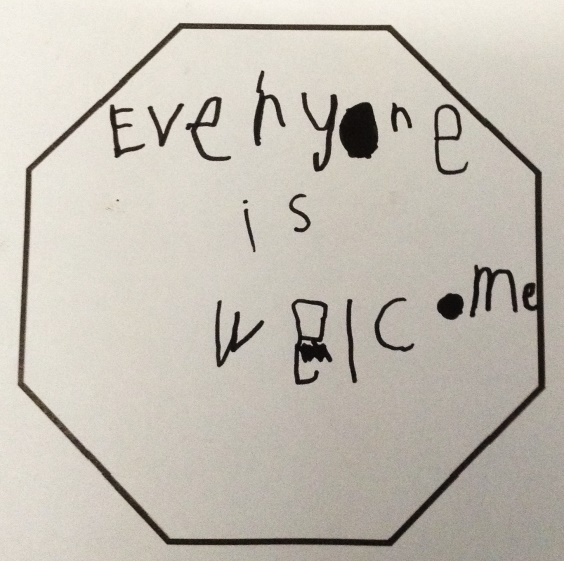 When a child suggested this, I knew that this inclusive idea was very important, but something an adult would be unlikely to think of. Children have unique perspectives, and the world is a lesser place when we don’t listen to them. UN General Assembly. (1989) Convention on the Rights of the Child, 20 November 1989, United Nations, Treaty Series, vol. 1577, p. 3. Play based experiences are a vital vehicle for children’s learning and development. Research shows the inherent relationship between sensory learning and children’s enhanced cognitive, social and physical development. This is because children gain understanding about the world by seeing, touching, tasting, smelling, moving and hearing the things they are learning about. The National Quality Framework encourages educators to consider how the physical environment, and the way that indoor and outdoor spaces are designed, will support children’s learning. Quality Area 3 of the National Quality Standard identifies that a service’s physical environment should be safe, suitable, appropriately resourced and well maintained. It also needs to be organised to support the participation of all children and implementation of the learning program. Recognition of the learning potential of environments is noted in the learning outcomes of the Early Years Learning Framework, which encourages educators to ‘create learning environments that encourage children to explore, solve problems, create and construct’ (p.15). between indoor and outdoor spaces. Children can learn about and respect the interdependence between people and nature by using their senses to explore natural environments. When designing and planning the learning environment, consideration needs to be given to children’s individual interests, skills and capabilities. The design of the play environment helps to promote independence, decision making, interaction, relationship building and testing theories. Engaging in sustained shared conversations by respectfully engaging with children allows educators to extend and support children’s thinking and learning. The image below from the Victorian Early Years Learning and Development Framework shows the balance between guided play and learning, adult led learning and child-directed play and learning. 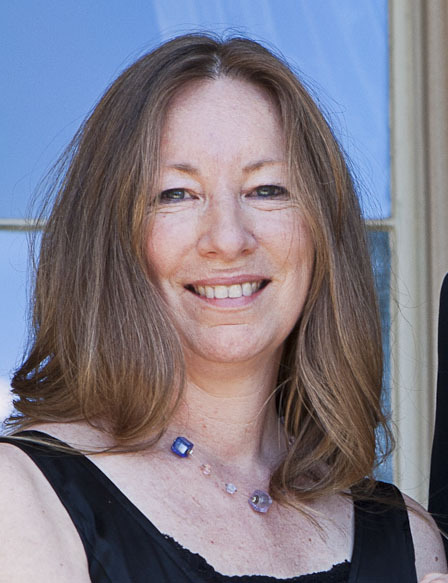 Ruth Garlick, an early childhood consultant for NSW Department of Education and Communities, has worked in the sector for more than 25 years. She recently was awarded the Premier’s University of Wollongong Early Childhood Scholarship, which included undertaking a study tour of Europe and Britain to visit several Nature Kindergartens. We hear from Ruth about her study tour and the importance of play whilst connecting children to nature. As an early childhood educator of more than 25 years, I often look back at my own childhood and wonder if I had somehow missed out by not going to preschool. Who would I be now if I had been given the chance to express my imaginings at an easel or create new worlds in the block corner? Our childhood provides the rare opportunity to explore and interact with the world without fear or judgment, our experiences and interactions shaping who we will be as adults. While I didn’t go to preschool, I did enjoy experiences that were rich in learning: I had a childhood of outdoor play. I was blessed with an expansive backyard, flower beds, veggie gardens and trees to climb. My childhood was ‘free range’ – one of danger and risks. Bumps and scrapes were an everyday event. We were left to our own devices for hours on end, even days on end during weekends and holidays. We would only return indoors for food, or comfort if something went wrong. Mothers would call from verandahs as the street lights came on. Kids would emerge from trees, cubbies and dried-out dams, racing home on bikes or in battered billy carts, shaking off dirt, scraping off mud and reluctantly going indoors for the family meal, then bath, TV and bed. I recall one of my earliest memories from when I was four or five, and the grief is still palpable. I had come across a dead magpie, lying on its belly, wings outstretched and head to the side, its lifeless eyes open to the elements and to me. It was under one of the many trees on our property and I was a long way from the house. I sat with the creature, patting its perfect black and white feathers, and sobbed my heart out. What was it about my early childhood experiences that gave me such an affinity with animals and with the environments that support their existence? In a world where green time is being replaced with screen time, how do children connect to their natural environment? How do we protect our wild spaces into the future? How do we promote sustainability? And whose responsibility is it? I recently returned from a study tour where I investigated the concept of early childhood forest schools in Scotland, England and Denmark. This was made possible through the Premier’s University of Wollongong Early Childhood Scholarship. I spent a month visiting sites where outdoor learning is either a major component of the educational setting or is the only component. At some of the sites, the children are outdoors in natural settings for the whole day, in all weathers, and have limited access to an indoor space. At other sites, there was a natural and free movement from indoors to outdoors and the play spaces outside were carefully planned with the use of natural elements in mind (and soul). Children’s voices were clearly represented in the designs and provisions. 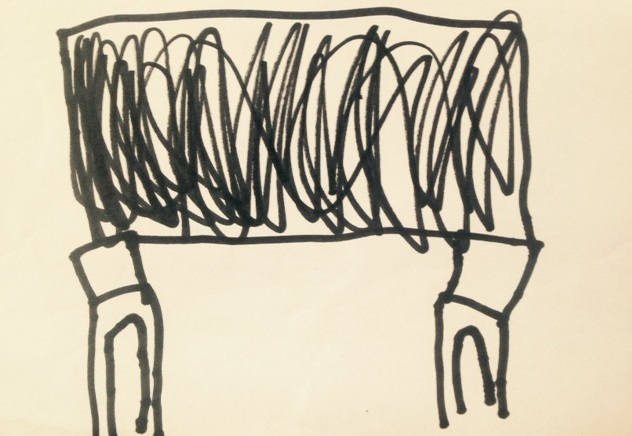 In one instance, a child’s drawing was exactly replicated in the design of a cubby. This was no token response to a child’s idea. It incorporated many months of collaboration and negotiation, documented in a book for all to share for years to come. 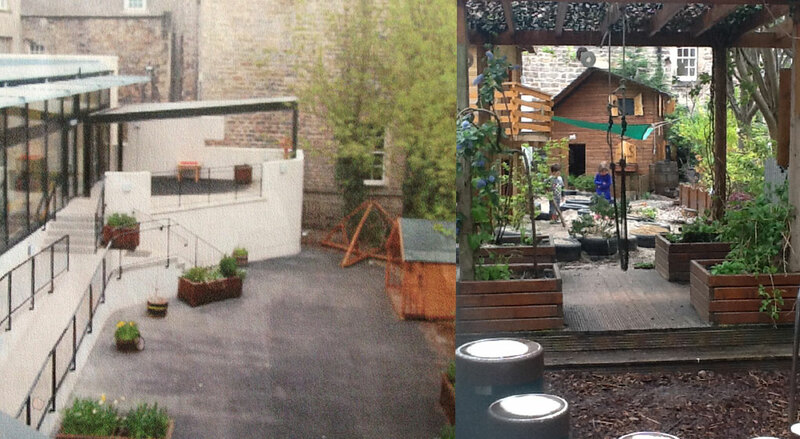 What started out as a stark concrete space squeezed between tight inner city apartments became a haven for children, a place where biodiversity could flourish. Small but dynamic. I stayed in Edinburgh for 10 days and as I wandered the streets, the only place I saw a butterfly was in this tiny garden. A number of themes presented themselves throughout the study tour. At every setting, I was met with a strong leadership team which successfully enabled change, bringing a shared vision of rich outdoor experiences to fruition. I was amazed by the impact this leadership had on the staff, on the parents and on the children. I saw leadership shared, with joint collaborations and support for the sort of rich learning that children were accessing every minute of the day. We all want children to leave their prior-to-school setting with the ability to succeed in their next adventure, that of formal schooling, but a response to this has often been to formalise early education and prepare children for academic learning, school structures, rules and conformity. In the settings I visited, I experienced a commitment to lifelong dispositions to learning. I interviewed parents about their aspirations for their children, and the message was loud and clear. They want their children to be confident, articulate, resilient and persistent. Surely these characteristics should hold as much, if not more, value in early education than teaching children how to hold their pencil accurately or how to count to 10? If we provide children with strong dispositions for learning, we are preparing them for life, not just for the formalised structures of schooling. As a society, we have become so risk-averse that children are often prevented from making judgements and assessing their own capacities and abilities. At Auchlone Nature Kindergarten, I walked along a fallen tree with a two year old. As we began, we were about a metre off the ground but as we progressed, the slope of the hill that the tree was resting on gave us more height. We would have been almost three metres off the ground before she took my hand and said “too big”. We made our way back and I was amazed at her ability to make her own judgment and at my ability to trust her instincts. At every site I was confronted with the dangers of tree climbing, bush walking, scampering over rocks, swinging on ropes and scaling to the tops of splintery stumps. There were brambles, uneven ground, stinging nettles and tree roots to trip on. Sticks were one of the main sources of play equipment and I saw them being used in a wide variety of ways. They are a great resource for open-ended play. I saw educators trusting children to make their own risk assessments. While the educators were available for support and guidance, there was no hovering or warnings to ‘be careful, you’ll fall’. Risk was viewed as a benefit, not something that needed to be managed. An engaging and exciting outdoor space that is filled with natural elements gives children opportunity for long periods of uninterrupted play and autonomy. At Cowgate under 5’s Centre, I accompanied the children to their forest site. There the educators followed children’s lead for the whole day. The day ebbed and flowed with the children deciding where they would explore and when it was time for the next adventure. The educator gave the children time, expertly listening to the group and helping the children to listen to each other. It was responsive and intuitive. I watched a small child lay himself close to the ground, as if needing to be one with the earth, and methodically construct a sand bridge with a hole he could look through. It took about an hour. He was in the flow zone where time ceases to matter and learning is optimised. Often we see the outdoor component of play as a place to run off steam before the real learning commences indoors. When children are given opportunities for extended periods of play outdoors, their senses are ignited, their affinity with active learning is activated, their curiosity and exploratory natures are set free and problem solving becomes a natural response to difficulties that need to be overcome. My experiences during my study tour consolidated this belief, which has always underpinned my early childhood ethos. The principles, practices and learning outcomes within the Early Years Learning Framework (EYLF) are all promoted through outdoor learning. Take any component of the EYLF and I know I could come up with an example from my trip that demonstrates how outdoor learning can provide a responsive approach within educational settings. I’m up for that challenge, maybe you could be too? I encourage all early childhood educators to take a stand for outdoor learning in natural play spaces, not only for what it can do to promote a more sustainable future, but for the benefits it can bring to our children at this very moment. A sense of ‘belonging’ to the earth is the first step to ‘being’ at peace within it. With these in place we will be more able to solve what is to ‘become’ of our fragile planet into the future. So, what is one thing that you can do? Decide what it is, preferably with the help of the children that you are educating, and do it. Then please celebrate what you have achieved together. I’d love to hear of your ideas. Feel free to comment on the blog.